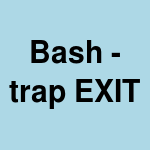 Bash scripts can trap EXIT signal and run clean up commands before exit. This is useful if a user kills a script or the script gets killed on its own due to errors. Here is sample code to which traps EXIT signal and calls a custom function onexit.